Kim Kardashian and Kanye West aren’t just growing their family—they’re expanding their real estate portfolio. Following the major news that the duo is expecting their fourth child, via surrogacy, the West’s have reportedly picked up a $14 million beachfront condo in Miami. How else would you expect superstar parents to celebrate? According to Page Six, the pair has been spotted viewing Unit 5A in Faena House, an 18-story luxury tower designed by architect Norman Foster. Given it’s superrich pedigree, locals have jokingly dubbed the building the “billionaire beach bunker.” In monthly rent, the West’s rumored new pad would run a cool $60,000. Peek inside the pair’s rumored new digs below. 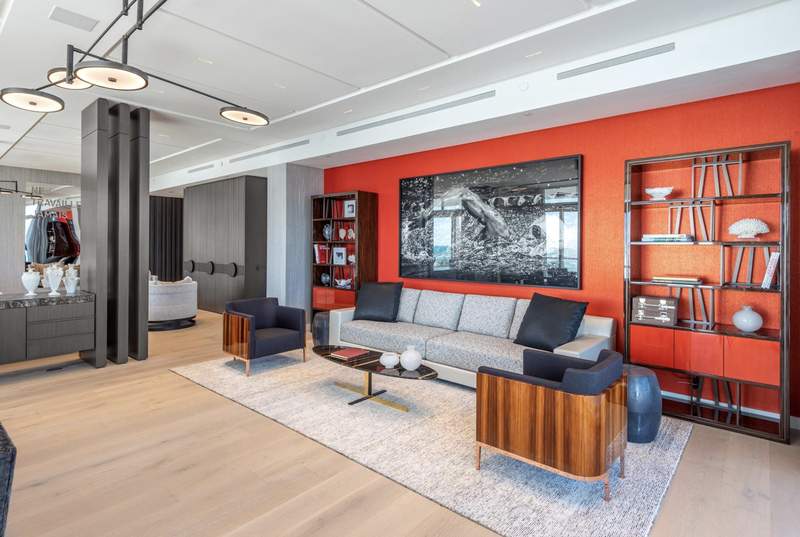 Formerly home to the brother of energy tycoon Len Blavatnik, the 4,700-square-foot condo is nothing short of extravagant. Complete with four bedrooms, a wraparound terrace, and a spacious media lounge, there’s more than enough room for the entire Kardashian clan—film crew included. While it’s likely that the couple will stick to their mansion in Hidden Hills, California, as their primary residence, the couple’s impending purchase will bring back special memories for E! fans. Yes, we’re secretly hoping there’s a Kourtney and Kim Take Miami reboot in the works. Watch one episode of Keeping Up With the Kardashians and you’ll quickly catch on that this is one family that loves an all-white kitchen. Finished with Venetian terrazzo flooring and Miele appliances, the kitchen and breakfast room are about as squeaky-clean as it gets. The same uninterrupted oceanfront views that frame the open-concept living and dining area carry on into each of the condo’s four bedrooms, all of which include floor-to-ceiling motorized shades for when the Florida sun becomes too strong. Of course, what would a “billionaire beach bunker” be without equally extravagant amenities? Whether they’re in town for Art Basel, a brief L.A. hiatus, or a red carpet walk, the Wests can take advantage of the Faena Houses’ bonuses, including the private fitness center, spa and sauna, and concierge. With one crib down, the West’s can officially enjoy their hunt for a second. Only, this time around, we’re hoping their findings are more suited for a nursery. Oren Alexander and Isaac Lustgarten of the Alexander Team at Douglas Elliman represent the star-approved listing.